As seen in many traditional STEM majors, womxn are underrepresented in the Economics program at UC Davis. 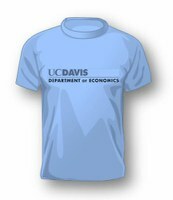 Although womxn make up the majority of the undergraduate population at UCDavis (59%), only 37% of declared Economics students are womxn. This number is only slightly higher than the national trend of gender imbalance where on average only 26% of womxn major in Economics. The Womxn in Economics Society exists to promote diversity in the Economics field and to foster opportunities for camaraderie and mentorship among womxn undergraduate students, graduate students, faculty, and alumni. Members of the organization will participate in a quarterly series of seminars, discussions, and potential field trips focused on life after graduation. The program will also highlight the research done by womxn economics faculty and encourage members to explore involvement in research and quantitative skill-building. A culminating event in Spring 2019 will also connect students with Economics alumni in order to promote career exploration, networking, and professional development. Please apply for Spring 2019 through the application available here. The application is due by Monday, March 18 at 8 am. Select Mondays from 12 - 1 pm in the Social Sciences and Humanities Building. Three seminar speakers will be available each quarter with at least one faculty member and one graduate student presenting each quarter. Each quarter, members must attend all meetings and are encouraged to attend at least one faculty office hours.